In years past, website owners could publish just about any content as long as it contained certain keywords at a certain frequency. Some web content managers hired unskilled writers at cheap rates to compose SEO articles and web content. In some cases the writers composed articles that were not even in their native languages. This made for choppy, confusing, unreadable prose. Other content managers used article spinning software to create large amounts of content on the cheap to market their websites. But changes in Google’s algorithms put a wrench in those plans. Nowadays, good quality content is “King” when it comes to getting top search engine rankings — not only on Google but on other major search engines as well. There are a few important details to keep in mind when you’re composing content for your website. One of the most important considerations to keep in mind when composing content for a website is that the content is original and unique. Google and other search engines are looking for fresh, new material to display in search results. If two or more instances of the same (or similar) content were to show up on the same page of search results, that isn’t helpful to the person searching for an answer. So make sure that your content is “freshly pressed” as WordPress calls it — whatever you decide to publish should not be a duplicate of anything else currently found on the web. An investment in good quality content is an invaluable contribution to your website’s success. Sentences that seem thrown together instead of telling a sensible story are not looked upon kindly by search engines. Sentences must be tight, smart and concise. They should make sense and be relevant to the topic at hand. It’s easy to tell when content has been composed by a human being who took plenty of time to think out the concepts and then flesh them out in writing. When you publish content online it should be almost 100% error-free. Rampant spelling, punctuation and grammar errors could turn off visitors to your site and increase your bounce rate (the rate of people who visit one page of your website and then immediately click away). Some people are very sensitive to spelling errors and may deem your site unprofessional — that could reduce future incoming traffic and also affect your search engine rankings. One of the most important elements of your web content should be its overall readability. 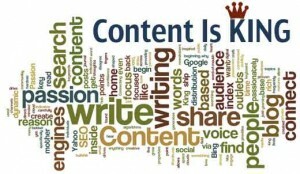 The content should be written so that visitors are intrigued. A visitor to your website should actually want to stick around for a while, read your content and then navigate further throughout the site. When that happens, search engines take notice and may rank your site higher. Going forward it is safe to assume that good quality web content is an absolute necessity for your website. If you’re having trouble getting decent ranking on search engines it may be time to re-evaluate your content strategy. Digital Pacific, based in Sydney and founded in 2000, provides domain name registration and carbon neutral scalable web hosting solutions to individuals, small to medium sized businesses and corporations. For further information the various services offered at Digital Pacific, visit our website or call 1300 MY HOST.